Extremely small structures, far smaller in diameter than a strand of hair, could greatly benefit sensors and other devices. To master these nanomaterials, scientists need to determine their shape. That's difficult. Scientists developed a new way to perform high-resolution, 3-D imaging of tiny metallic structures. The method uses scanning transmission electron microscopy (STEM). Using this method, scientists measured the 3-D structure of tiny gold stars, "nanostars." Combined with computer simulations, the new method accurately predicted the physical and optical properties when compared with experiment. For the first time, scientists used STEM tomography to predict the physical and optical properties of a nanomaterial. These materials can have enhanced optical properties, stemming from plasmonic effects. This new method holds promise for estimating the shape and related parameters of complex structures of any arbitrary shape and composition. These materials could lead to new sensors and diagnostic uses. Gold nanostars are a class of plasmonic nanomaterials that show promise in surface-enhanced Raman scattering-based applications and hot electron-driven plasmonic devices. However, important fundamental material properties are difficult to measure, because of their complex, spiky morphology— which is fundamental to the field enhancements that make nanostars interesting. Typically, nanostar properties such as volume, surface area, and extinction coefficient are merely estimated using a highly simplified, tractable—but often inaccurate—representation of the morphology. 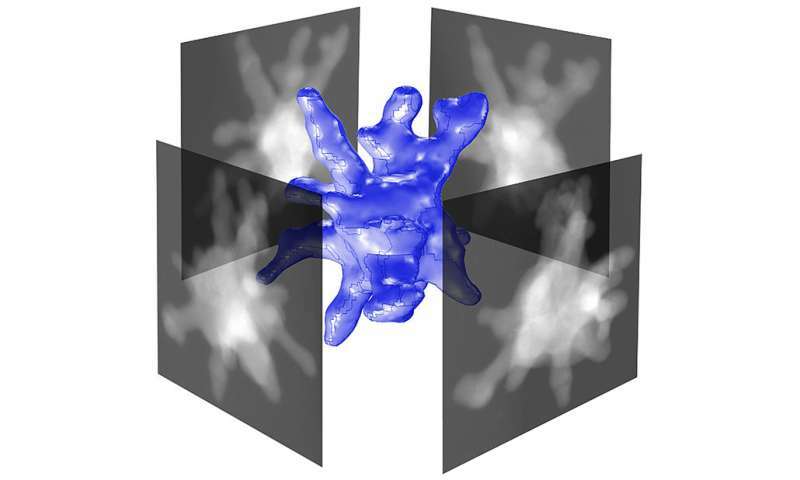 In this work, the Center for Functional Nanomaterials (CFN) users from Rutgers University and CFN staff devised a new method for calculating these fundamental material properties, using high-resolution, 3-D topographic information about individual nanostars as inputs for finite element calculations of volume, surface area, and morphology-dependent extinction coefficient. They obtained 3-D morphologies with the STEM tomography. This new method holds promise for estimating shape-dependent parameters of complex nanostructures of any arbitrary shape and composition, highly relevant for plasmonic materials and devices.